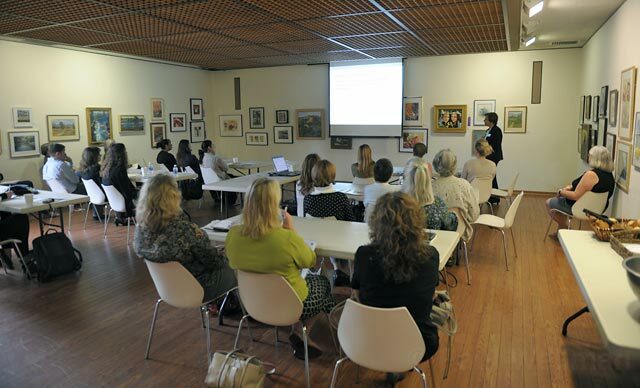 The Community Action Commission (CAC) of Santa Barbara held its first educational forum last Friday at the Goleta Valley Library to discuss new research showing immediate gains in kindergarten readiness for children who participate in Santa Barbara County Head Start programs. The report, which analyzes research conducted by the UCSB Gervitz Graduate School of Education and local school districts, tracks the progress of children in the Santa Maria Bonita school district from preschool through the fourth grade. Students who rated high for kindergarten readiness were more likely to perform well on standardized testing, and performed better than students with no preschool experience. Eighty-one percent of Head Start children ranked within the top two levels of kindergarten readiness criteria, compared to 36 percent of the no preschool group. The criteria assesses physical and health readiness, social-emotional readiness, and school-ready knowledge. With 75 percent of Head Start children born into families in poverty, the research also looks at specific challenges that face children enrolled in the program. For example, 15 percent of Head Start children have a diagnosed disability compared to 5 percent of other children in county school districts. Thirty-three percent of Head Start children are overweight for their age, compared to 11 percent of other children. Faced with these challenges, CAC management specialist Holly Carmody emphasizes the program’s comprehensive services as a key to helping children in need prepare for kindergarten. County Head Start not only offers on-site medical, dental and developmental screenings, but also encourages parent volunteering and participation in ESL classes. Often going door-to-door, posting fliers in apartment laundry rooms and spreading the program by word-of-mouth, the program’s strong community involvement and support is the result of a hands-on approach that makes Head Start a feature in families lives, says Child Services director Mattie Gadsby. With 83 percent of parents reporting at least one positive family impact as a result of their child’s enrollment, she believes a bilingual approach is essential to long-term involvement and making parents feel welcome. “We actively promote development of a home language at the same time that we work on English acquisition. When the home language is not honored…children grow up without being able to talk to their parents,” Gadsby said. Although 1,152 children were enrolled in Head Start last year, the program has a waiting list of nearly 1,671 as of May 2011. And with federal funds for Head Start frozen and a state budget yet to be passed, the county’s ability to expand, or even maintain, its services is uncertain. Fran Forman, executive director at CAC, hopes that this latest research will only strengthen public support to continue, and possibly increase, funding for early childhood education programs.